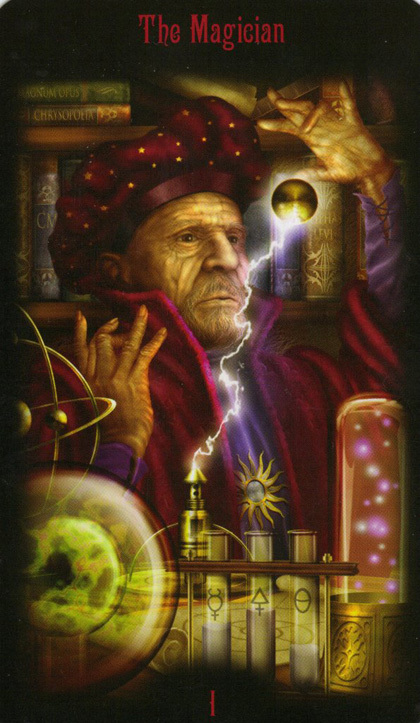 Legacy of the Divine Tarot was created by award-winning digital artist Ciro Marchetti. The story behind the images in the cards is a tale of an ancient world destroyed. Having their devastation foretold, they were able to plan for survivors and leave behind a legacy of secret portals containing knowledge. One of the first things that stand out in this deck are the Knights, which are depicted by a single helmet and background. There is no body to go with the helmet. This unique concept allows the reader to immediately recognize the knight, yet it leaves the persona behind the helmet fresh with every reading. Take a closer look: The Magician has six fingers! The Faith card replaces the usual Hierophant and depicts four different religious leaders. The Fool is creatively shown halfway through the Major Arcana as the Hanged Man. He also appears in the Wheel of Fortune and Devil cards and shows up again at the end of the journey in the World card.